Just a little spoonerism for youse guys on this balmy Monday morning. Also, some pickles. Pickles made to taste something like the Claussen variety, to be more specific. As someone who hasn't yet learned to enjoy the taste of pickles that aren't at least slightly sweet, I had to rely on my #1 taste tester and main squeeze to determine if these were, in fact, similar to Claussens, and he felt that they were. I may have overdone it with the dehydrated onion in the first batch, as after a month or so, the brine turned cloudy and developed an off-odor and gave my fella's tongue a tingle. Always one to try to learn from my mistakes, I used about half as much onion in the second and third batches, but I processed those*, so we'll just have to wait and see if the onions were indeed the culprit. *If you do process your pickles in a hot water bath and that whole rigmarole, be sure to squish as many cukes into the jars as possible--they shrink up considerably! 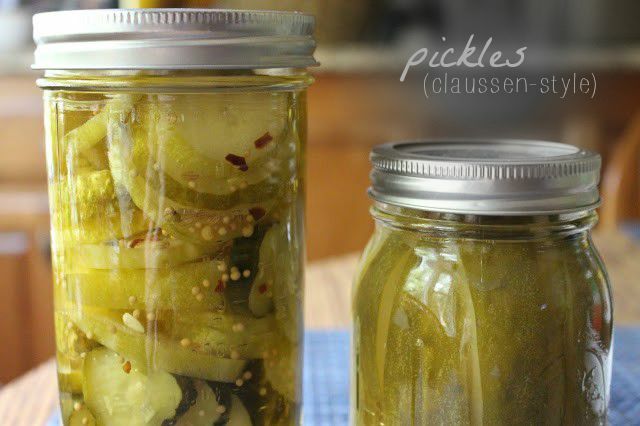 These pickles are a great way to preserve an abundance of cucumbers! Just keep your onions in check--nobody likes a tingly tongue. Sterilize your jars by immersing them in boiling water. Remove from the boiling water and place on a clean, dry towel. In a large, nonreactive pan, place the water, vinegar, salt, minced onion, peppercorns, mustard seeds, garlic powder, and crushed red pepper flakes. Bring the brine to a boil to dissolve the salt, then allow to cool. Add the fresh dill and cut cucumbers to the sterilized jars, cramming in as many as pieces as possible. Carefully add the brine to the jars, filling to 1/2-inch below the lip. Try to distribute particulates in the brine evenly among the jars. Put the lid on the jar, and turn the pickles a few times to distribute the seasoning through the pickles. On the fourth day, refrigerate the pickles. Alternatively, you can process the jars for longer preservation. Instructions here. Delicious! Perfect in a sandwich. This seems EASY enough for me to try too and not to mention it's very delicious. Apple cider vinegar must be the secret. Well done, Grace! I have to admit that I prefer some sweet to my pickles but sometimes one of those salty pickles really hit the spot! Not a big pickle lover, except the Lady Ashburnham type,but have thoroughly enjoyed learning a new word. *spoonerism*. Am familiar with the slip of the tongue type... and have used "pickled tink" my self from time to time, but didn't know there was a word to describe it. Have a great week. A great way to preserve and enjoy throughout the year! We love pickles around here! Must try to make these! Yum. So good with sandwiches! Love sweet pickles too, but sometimes you've gotta have the dills. I love pickles! In fact, I love them so much that my husband usually picks the pickle out of his burger and even gives it to me. Now, that's love, huh? But like you, I find pickles just the perfect nosh. I always hate to admit this, but I don't like pickles! But.. being new to canning, I still had to read through your recipe to help me learn all this stuff. In your writing, I just figured out a piece I have been struggling with. Thanking you..... more than you will ever know!